Here's what we've been working on. I've been enjoying working on this show a lot more than I expected, and I'm pretty proud of some of the work I've done (which is a big deal for me). None of my shots appear in the trailer, so I guess you'll have to wait until next June to see 'em. Enjoy! ty! :) This is awesome! I have a feeling I'm going to choke up during it though... the beginning of the short trailer already pulls at the heart strings. oy. I'm glad the trailer has comedic relief. haha Spanish Buzz is fantastic! Can't wait to see this. It's looking great already! Hope there have been no complications in the process so far! 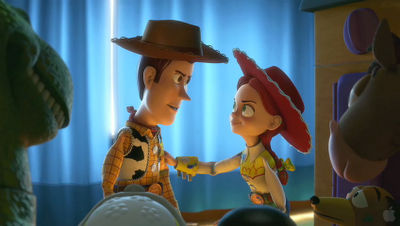 It makes me remember the first time when I watched Toy Story 1 in the theaters. Will you be working on the sound post-production like you did with Cars shorts too Victor, or just animating it? The image quality is SOOOOOO much better than the last two movies. It definitly shows a lot more than from Toy Story 1 to 2.
wow I can't wait to see the shots you're proud of, and all the rest too :) it's so nice to meet all the characters again, was spanish buzz actually animated by carlos? haha. I hope you'll continue to have a great time working on the movie. how do you deal with the high expectations, I guess you guys feel a little bit of pressure making each shot great (for this film especially)? does that still make you nervous after you've been in the industry for years? do you know the characters so well that acting choices come easy? Thomas, Carlos is doing a lot of key Buzz animation, yes! I admit I was a bit intimidated at the idea of animating these classic characters. They are so well-established and I was afraid I wouldn't be able to come up with original ideas that were consistent with their personalities, or that I would do them some disservice. So far it's not been a problem, and I'm pretty happy with how things are turning out. It helps that there are plenty of people around who have experience with these characters and can ofter good advice. James, I will be mentoring in Winter term. Maybe I'll see you there! Christiano, I'm just animating on this one, and only for 3 more weeks at that. I know this will be a great film, Lee Unkrich is great. But 'm sorry, I'm disappointed with this trailer. The opening is so much like Jesse's song from TS2. And there are gestures and ideas that borrow too much from the first film. “No one's getting thrown away” looks just like “He's not a space ranger”. “This is no time to get hysterical”, sounds so much like “ This is no time to panic”. I'm probably nit-picking and too close since I worked on the first film. But I hope these “homages” are not too plentiful.